The Respect coalition have received a "fantastic response" to their campaign and hope to win at least one if not two European seats, a spokesman said. Ron McKay says he believes they will mainly gain votes from a swing against Labour in the wake of the Iraq war. He said the coalition was doing well in London and the West Midlands partly due to Muslim voters backing them. 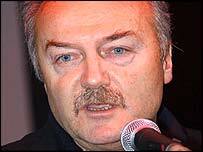 He said he believed George Galloway MP, formerly a Labour MP, could well find himself elected an MEP in London. Mr McKay added Respect was also doing "particularly well" in the West Midlands and Yorkshire and the Humber. "We are getting a lot of disillusioned Labour members joining our party," he said. And he claimed that in Tuesday's post alone there were more than 300 letters of support and more than £3,000 in donations. Mr McKay says that in addition to support from Labour, Respect was picking up some backing from Green supporters and he suggested that their MEP in the south east, Dr Caroline Lucas, could lose her seat. He told BBC News Online that the left-wing coalition had more members than the Green Party and was fielding a large number of Muslim candidates. "We will get about one Greater London Assembly member, George Galloway in the London European region and I am hopeful we will take a [European] seat in the West Midlands." Respect was formed in January and brings together a variety of campaigners under its full name: Respect Equality Socialism Peace Environment Community Trade Unionism.